Looking to go paintballing? If you reside within the Minneapolis metro area, you are fortunate! 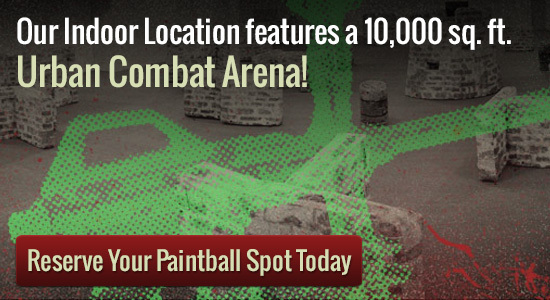 Come check out the premier paintballing park in the region, Splatball! Splatball offers a number of enjoyable packages from youth group excursions to bachelor parties and kids birthday parties. Our Minneapolis indoor location is in the heart of the Twin Cities. We are the oldest paintball field in Minnesota. Our facility features a 10,000 square foot urban combat arena as well as the largest retail store/tech center in Minnesota. The entire paintballing facility is climate controlled. We even have an observation area and private party room so it is perfect for hosting events such as birthday parties. Aside from being fun, paintballing can be incredibly good for your health. It is an excellent way to burn calories, and can increase coordination. It can work on team building skills as well. Splatball has a team of highly trained and friendly staff to demonstrate how to work the CO2 and compressed air guns, as well as how to properly wear the safety equipment. Staff also ensures the safety of players on the course during the game. Splatball is open to players of nearly any age (a minimum age applies). Both private play and walk-on play are available at Splatball. Private games and walk-on play sessions are available throughout the week. Reservations are not required, but are recommended for larger groups or groups that want to play during a specific time. You can reserve your spot by giving us a call at 612-378-0385. Spots fill up fast, so make sure to book at least a week in advance.